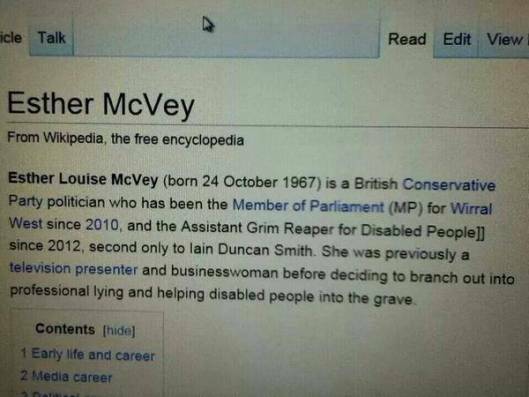 Could the truth be stranger than Esther McVey’s Wikipedia entry? It appears that somebody with a social conscience has edited Esther McVey’s Wikipedia entry to provide what some might call a more accurate description of her Parliamentary responsibilities. The edits have since been erased but at the time of writing, the entry starts: “Esther “no brains” McVey (born 24 October 1767)”. Previous PostIs IDS about to be given his marching orders?Next PostAnother Government ‘Fag packet’ proposal for Benefit Sanctions & Cuts ?